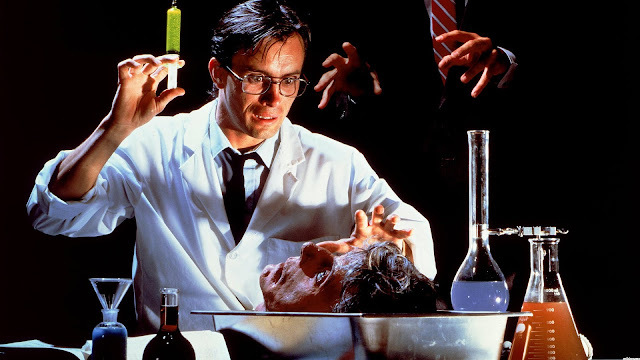 Re-animator is Stuart Gordon's loose adaptation of an HP Lovecraft short. A ridiculously campy horror comedy that has gained a cult status as one of the genre's best. It's not. However, it is stupidly funny and definitely a good time. This is one that should be seen by all fans of the horror genre. It details mad scientist Herbert West's (Jeffrey Combs) desire to stop death. He's a creepy dude from the start and when he moves in with roommate Dan Cain (Bruce Abbot), his experiments on reanimation really take over. It's funny how quickly Cain goes along with West's crazy plans, and soon they've worked their way into the hospital morgue to get their experiment out of the animal stage and into some humans! It obviously doesn't go well and a reainmated corpse wakes up and goes nuts and ends up killing the dean of the college. Through a series of hijinx, rival teacher/scientist Dr. Carl Hill (David Gale), ends up as one of the zombie like corpses but has the power to control the other zombies. Yep. It's just as ridiculous as it sounds. And just as fun. Especially the decapitated "head" scene. So yeah, give Re-animator a try if you're ready for some goofy gory fun. What is the most ICONIC Godzilla To YOU? (c) 2015 PopCultureCast. Simple theme. Powered by Blogger.